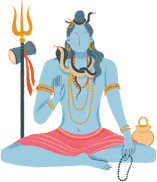 Hinduism perceives the whole creation and its cosmic activity as the work of three fundamental forces symbolized by three gods, which constitutes the Hindu Trinity or ‘Trimurti’: Brahma — the creator, Vishnu — the sustainer, and Shiva — the destroyer. Brahma is the creator of the universe and of all beings, as depicted in the Hindu cosmology. The Vedas, the oldest and the holiest of Hindu scriptures, are attributed to Brahma, and thus Brahma is regarded as the father of dharma. He is not to be confused with Brahman which is a general term for the Supreme Being or Almighty God. Although Brahma is one of the Trinity, his popularity is no match to that of Vishnu and Shiva. Brahma is to be found to exist more in scriptures than in homes and temples. In fact, it is hard to find a temple dedicated to Brahma. One such temple is located in Pushkar in Rajasthan. According to the Puranas, Brahma is the son of God, and often referred to as Prajapati. The ​Shatapatha Brahman says that Brahma was born of the Supreme Being Brahman and the female energy known as Maya. Wishing to create the universe, Brahman first created the water, in which he placed his seed. This seed transformed into a golden egg, from which Brahma appeared. For this reason, Brahma is also known as ‘Hiranyagarbha’. According to another legend, Brahma is self-born out of a lotus flower which grew from the navel of Vishnu. In order to help him create the universe, Brahma gave birth to the 11 forefathers of the human race called ‘Prajapatis’ and the seven great sages or the ‘Saptarishi’. These children or mind-sons of Brahma, who were born out of his mind rather than body, are called the ‘Manasputras’. 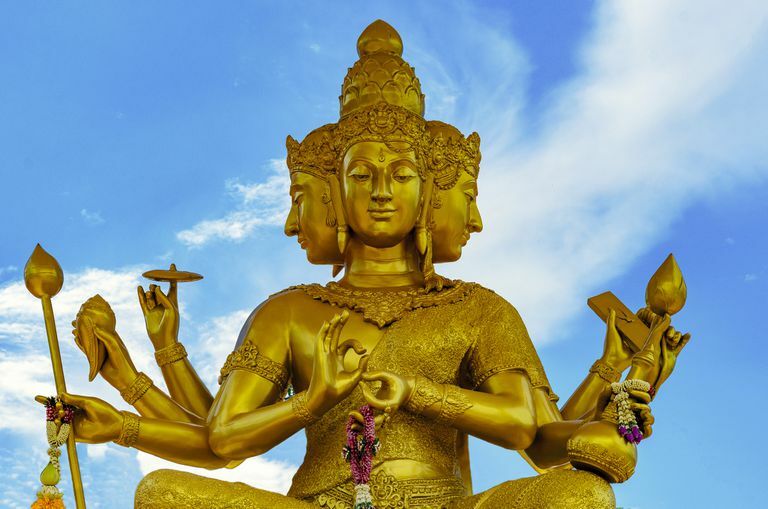 In the Hindu pantheon, Brahma is commonly represented as having four heads, four arms, and red skin. Unlike all the other Hindu gods, Brahma carries no weapon in his hands. He holds a water-pot, a spoon, a book of prayers or the Vedas, a rosary and sometimes a lotus. He sits on a lotus in the lotus pose and moves around on a white swan, possessing the magical ability to separate milk from a mixture of water and milk. Brahma is often depicted as having long, white beard, with each of his heads reciting the four Vedas. Brahma presides over 'Brahmaloka,' a universe that contains all the splendors of the earth and all other worlds. In Hindu cosmology, the universe exists for a single day called the ‘Brahmakalpa’. This day is equivalent to four billion earth years, at the end of which the whole universe gets dissolved. This process is called ‘pralaya’, which repeats for such 100 years, a period that represents Brahma's lifespan. After Brahma's "death", it is necessary that another 100 of his years pass until he is reborn and the whole creation begins anew. Linga Purana, which delineates the clear calculations of the different cycles, indicates that Brahma's life is divided in one thousand cycles or ‘Maha Yugas’. Ralph Waldo Emerson (1803-1882) wrote a poem called "Brahma" that was published in the Atlantic in 1857, which shows many ideas from Emerson's reading of Hindu scriptures and philosophy. He interpreted Brahma as "unchanging reality" in contrast to Maya, "the changing, illusory world of appearance." Brahma is infinite, serene, invisible, imperishable, immutable, formless, one and eternal, said Arthur Christy (1899 – 1946), the American author and critic.